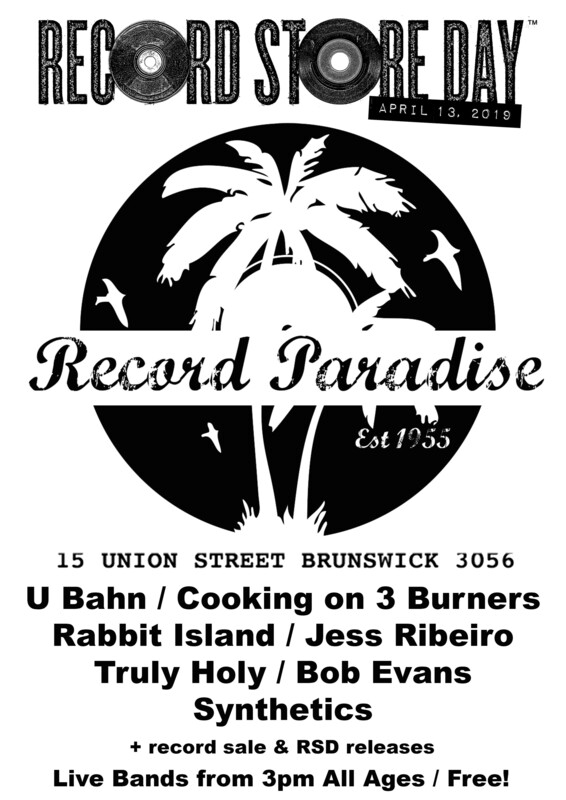 To celebrate the vinyl release of Suburban Songbook for the first time ever in conjunction with Record Store Day Australia on APRIL 13TH I'm going to be heading down to Record Paradise in Brunswick, Victoria to play a few songs from the record. It's free entry of course and I'll even scribble on your copy if that's your thing. This release is strictly limited, 180 grams and comes in transparent yellow! Free Entry & All Ages. 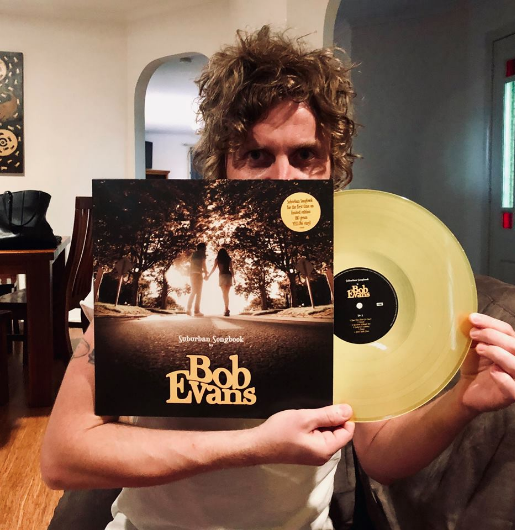 So there is a huge amount of activity at Bob Evans HQ right now, with a heap of shows and other special treats all being busily planned and prepared. So I thought it best that I write to you all once more, my loyal brethren, so you have all the most up to date information that you need! First up, I am super excited to announce that I will be playing a very special charity event in my home town of Fremantle, WA on Thursday March 28th. 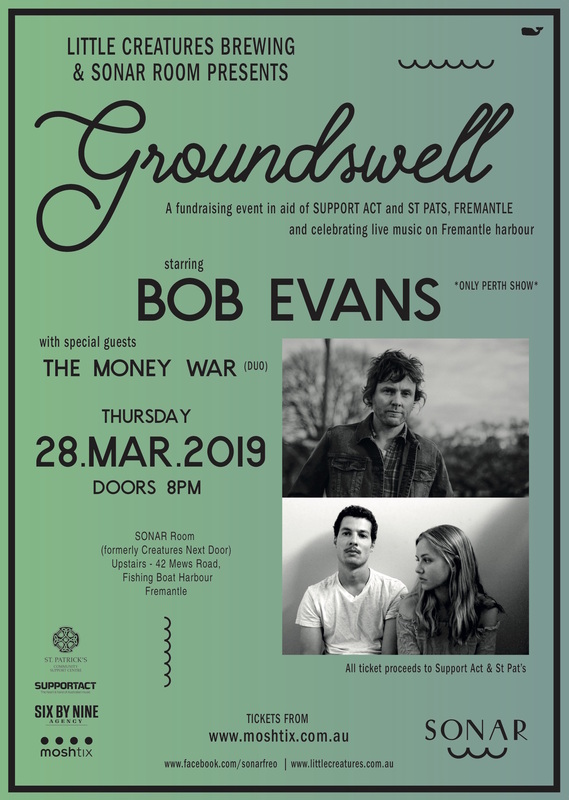 The show is called Groundswell and 100% of the ticket sales will go directly to Support Act, a charity that supports members of the music industry in times of crisis, as well as to St Pats Community Support Centre in Fremantle. I will be performing in special duo mode, with my dear friend Ben Witt on electric guitar, who is practically coming straight from the airport after touring Europe and the USA with Meg Mac. Tickets are limited so please come and join me for what will be a really special night. Unfortunately as a consequence of this I have made the very difficult decision to cancel my show at The Publican in Mornington on March 28th. This is a decision that was exceptionally hard to make as I’m proud of my track record over the last 20+ years of not cancelling shows but I will look at re scheduling another show for later in the year for those of you who were planning on coming along. Please go to your place of purchase for a full refund and accept my sincere apologies. All the other shows on my upcoming Full Circle solo tour will be unaffected by this change of plans and are going full steam ahead! The tour kicks off NEXT WEEK in NSW, with Narrabeen RSL on THURSDAY MARCH 14th, 48 Watt St in Newcastle on FRIDAY MARCH 15th and the Heritage Hotel in Bulli on SATURDAY MARCH 16th. After that I will be at Sooki Lounge in Belgrave on FRIDAY MARCH 29th and Karova Lounge in Ballarat on SATURDAY MARCH 30th. I will be playing all the hits and misses off last years Full Circle (Best of) album as well as conducting a song raffle giving you a chance to request any Bob Evans song you like if your number gets called. Tickets to all shows are selling fast and can be purchased here. Don’t forget I am also touring the country in support of The Whitlams through May, June and July! Finally, I announced late last week the massive news that my 2006 album “Suburban Songbook” will be released for the first time ever as a limited edition coloured vinyl in conjunction with Record Store Day on April 13th. I am so incredibly thrilled that this album which means so much to me will finally be getting the vinyl treatment. It sounds beautiful. I am organising some live instore performances around Melbourne to celebrate on Record Store Day and will announce details as soon as they are confirmed. PHEW! I think that’s everything! I hope you can make it to a show over the next few months. 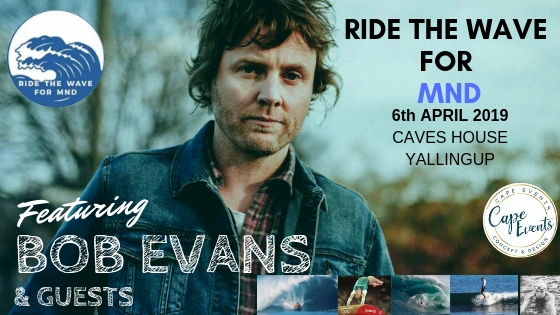 I'm going to be playing this very special show at Caves House in Yallingup on SATURDAY APRIL 6TH raising money for Motor Neuron Disease research. The venue is stunning and there's gonna be heaps going on so book in your road trip weekend and be part of a wonderful cause. I have some really exciting news for you today! In conjunction with Record Store Day on Saturday April 13th, my 2006 album “Suburban Songbook” will be released on vinyl for the first time ever! You guys know the importance of this record for me. I recorded it in Nashville with Brad Jones after 2 years of demoing it in the sunroom of my Perth home. The following year the first single released from it, “Don’t You Think it’s Time?” became the biggest song of my career to date and the album ended up going Gold in Australia, as well as allowing me to tour in the UK, US, Spain and South Africa. 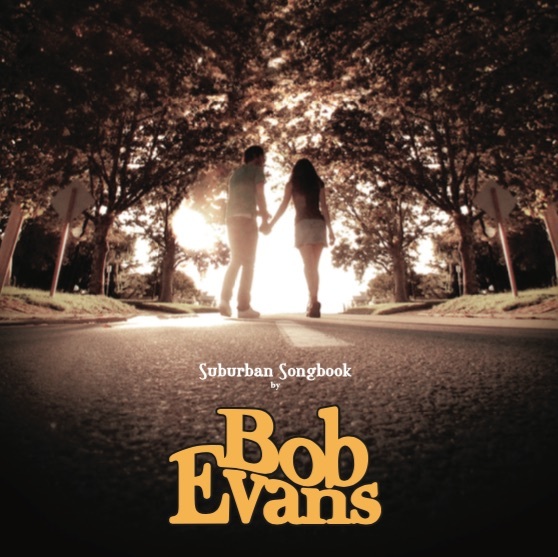 “Suburban Songbook” is a watershed album that represents a turning point in my life, where my career as a musician and my personal life intertwined and set me off on a brand new course. I always imagined this album and it’s cover art in the form of a traditional vinyl release, so you can probably imagine how proud I am to finally see it come to life all of these years later! The vinyl release of “Suburban Songbook” comes in translucent Sunny Yellow, in homage to all of those Western Australian afternoons spent conceiving the record alone in the back sun room of my house. It’s a solid 180 gram, nice and heavy on the turntable and sounds fantastic. For those who are unable to make it to a record store on Saturday April 13th, any remaining copies will be available to purchase from my website or at my shows until stock runs out.